B&L Ott offers comprehensive routine maintenance, tune-up, and inspection of your home heating and cooling systems. Regular maintenance offers peace of mind that your home systems are safe to use and in proper working order. Scheduled inspections and tune-ups can prevent the need for more expensive repairs down the line. Lower Bills – Just under half of the average utility bill goes toward heating and cooling. A well-maintained HVAC system, however, will use less energy and lower your average bill. Regular maintenance will also prevent small problems from becoming major problems. Better Air Quality – Routine maintenance of your HVAC system helps clear the air of pollutants such as pollen, dust, mold, and bacteria. By having B&L Ott clean and change components of your system, your family will be able to breathe better. Longevity – Most modern HVAC systems last 15-20 years. Regular inspections and tune-ups can help make sure your system lasts this long and can even help it last longer. This will help your investment pay off in the long run. Efficiency – Routine maintenance helps rid of all the issues that cause your system to have to work harder. With fewer issues, your system will use less energy and help protect the environment. Reliability – Keeping your HVAC system at the highest efficiency will also ensure readability. If the system does not have to work as hard, you can be sure it is still working for you when you need it most. Routine checks are especially important for heating systems before the winter season. It is a good idea to have your system serviced 1-2 times each year. B&L Ott’s technicians will check all of your HVAC system’s mechanisms including the burner and heat exchanger. They will also look for any major issues such as potential gas and carbon leakage. For air conditioning systems, technicians will check for any current or potential issues and can provide energy efficiency recommendations and tips during the inspection. The maintenance can also help you maintain the manufacturer’s warranty if required. Contact B&L Ott for routine maintenance of your HVAC heating and cooling systems. 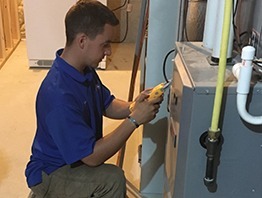 It’s better to schedule a routine inspection now rather than needing a heater repair in the dead of winter or an air conditioning repair in the summer heat. Do You Want Maintenance on AC, Heating, or Both?